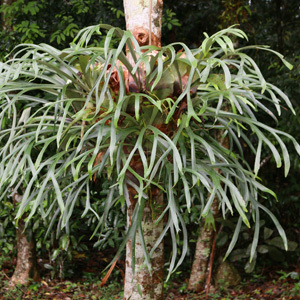 The Elkhorn Fern (Platycerium bifurcatum), also known as the Staghorn Fern, is named after its large fronds that look like Elk horns. A truly spectacular looking fern that despite it’s exotic appearance is very easy to grow. Attaches well to trunks of other trees and ferns, and can be mounted on a block to enable easy maintenance. A light shade position with patches of sunlight is recommended. Will cope with light frosts but will need protection in colder areas. Good drainage is essential but like all ferns, does need regular watering, especially in dry conditions.